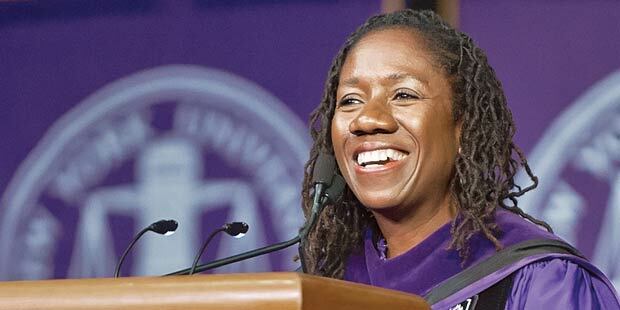 Reflecting on the significant anniversaries of major civil rights victories, Sherrilyn Ifill ’87 gave a stirring convocation speech exhorting graduating JD and LLM students to join her in “perfecting this democracy.” Ifill, president and director-counsel of the NAACP Legal Defense and Educational Fund, capped a festive celebration of academic achievement that included bagpipes and speeches by Dean Trevor Morrison, Board Chairman Anthony Welters ’77, NYU President John Sexton, and graduands David Leapheart ’14 and Stephanie Chu LLM ’14. Ifill, the keynote and final speaker, urged every lawyer to find a way to be a civil rights lawyer no matter their chosen career path. She noted that 2014 marks the 50th anniversary of the Civil Rights Act, the 50th anniversary of Freedom Summer, and the 60th anniversary of Brown v. Board of Education. “What that means for us sitting here today, in all of our diversity, in all of our cosmopolitan sophistication, what that means is that this country as you and I have been privileged to know it is less than 60 years old,” Ifill said.